Tesla founder Elon Musk continues to fly the flag for altruism by giving competitors access to its electric car patents. A staggering move to the automotive industry, but Steve Sammartino writes that it’s an ingenious marketing play. It’s easy to admire uber-entrepreneur and altruistic world changer Elon Musk. Not only has he shown his global marketing chops more than a few times with successful start-ups PayPal, Space X and Solar City, he’s also embarking upon a number of philanthropic projects with his well earned wealth. That altruism flag was recently flown again when his company Tesla announced that it will be opening up its electric car patents for competitor access. Tesla so far has not only shown Detroit how real innovation is done, but it has even the most optimistic car industry pundit flabbergasted by what it has achieved. In case you’re just catching up, let’s review a few of Tesla’s numbers. It already has a market capitalisation of $30 billion, that’s more than half the value of GM. It sold more than 25,000 cars last year and expects to sell a further 35,000 cars in 2014. The marketing lessons run deep, as its top-down premium vehicle strategy has enabled it to build a brand which doesn’t require advertising, or even an advertising agency. While the altruism of opening up patents is clear, it’s also very clear that there are a number of business strategy benefits to the decision. In fact, it’s a genius level marketing play. We need to remember that Tesla is now the clear leader in electric motor vehicles. It’s well ahead on both the learning curve and manufacturing infrastructure development. The mere opening up of the patents gives Tesla the potential to sell components to other auto players. People forget that in order to leverage the patents, other car manufacturers will need some kind of manufacturing output. 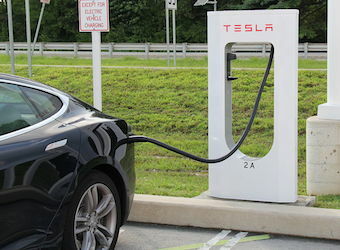 It’s foreseeable that Tesla will become a key supplier to the industry. Tesla plans to build giant battery factories, which other car players will need, and it could also sell electric car power trains, and all manner of digital technology inside the car. It is very much a move which replicates the digital world – an open-source ethic which allows the leading brand to own the eco system. We often hear the word ‘synergy’ – which is most often a boardroom sound bite to get approval for an acquisition that makes the CEO get more power. This might be one time that synergy actually exists. If Tesla can switch the market to electric vehicles, Musk’s other start-up, Solar City, could be a major beneficiary. He won’t just be selling everyone the cars, but he’ll also become their petrol station as homes around the world also convert into mini electric power plants. In many ways it’s the open-source era of manufacturing. In the digital world, brands run an open ‘application program interface’ (API), which opens up part of the company data for others to use and innovate around. It’s a great way to get innovations at low cost and build a powerful eco system. What part of our company can we hand over to entrepreneurs and even competitors? It doesn’t matter what the brand makes or sells, industrial companies need to revisit their marketing playbook. Steve Sammartino is a Melbourne-based marketing guy and entrepreneur. His new book, The Great Fragmentation, is a marketing manifesto for the technology age, out 24 July.